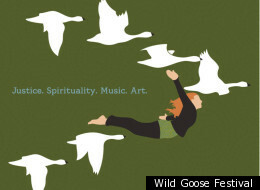 We’re really excited to be going to the Wild Goose Festival. In it’s first year, the festival features music, speakers and art–oriented in what is being called “progressive” Christianity. We’re looking forward to seeing some of the contemporary thinkers we most admire–Brian McClaren and Shane Claiborne, for example–as well as hearing some great music from folks like Derek Webb, Michelle Shocked and Beth Nielsen-Chapman. We’re going to be camping, which is something we haven’t done for a while. Should be interesting. This means no blog posts on Friday and Saturday. But it also means I’ll be getting a lot of material for the future.